If you’re planning a honeymoon then there’s a good chance you’ve come across the Maldives on your searches. The Maldives is without doubt one of the most luxurious places on the planet, and the perfect location to starting married life off in the best possible way. So what do we know about the Maldives? Luxury resorts, beautiful beaches, clear blue seas and all the pool side cocktails you can sink, but the Maldives does have a few surprises that you might not have come across. 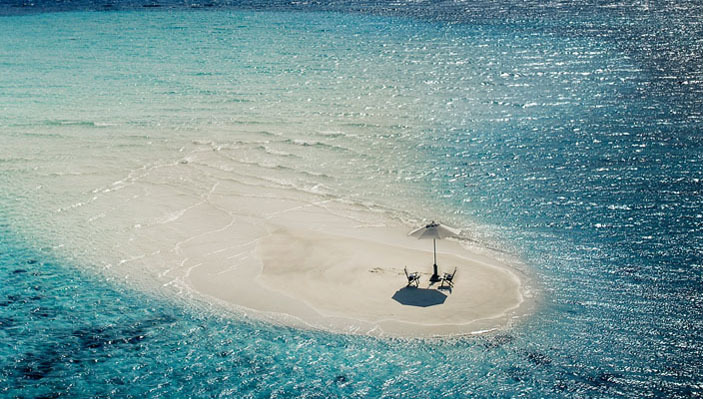 With around 1200 islands it’s not actually that difficult to find your own piece of deserted island. Kolhumadulu and Addu City are romantic havens that you can enjoy in privacy. Most Maldivian resorts will be able to create experiences that could include a moonlit dinner, a picnic on the beach or even become a castaway on the island for the night. The Indian Ocean waters are full of breath-taking diving experiences, but if you head south you’ll be rewarded with stunning marine life, shipwrecks and underwater caves coated in colourful coral gardens. The best dive sites for shipwrecks can be found in South Male Atoll. The Maldives leaves you spoilt when it comes to diving, but only a few locations offer the chance to swim with sharks… Yes actual sharks! Whale sharks however brush off the ferocious tags you’d normally associate with this under water beast, and offer life enhancing experiences. Whale sharks can grow up to a whopping 42ft and are completely non- aggressive – they pose no threat to swimmers or divers due to their playful, calm and docile nature. For those who don’t fancy putting on the scuba gear, there is another way of seeing the underwater beauty of the Maldives. Located in the capital of Male the ‘Whale’ submarine adventure is an excellent way to sample the sensation of diving in a submarine. One of the more well-known resorts in the Maldives, the Conrad Rangali is famous for being voted ‘the best hotel in the world’ twice and its amazing underwater restaurant Ithaa - not very secret you might be thinking. However not many people are aware that for around £7,500 (per night) the restaurant can be turned into an underwater bedroom that offers a private champagne dinner, breakfast in bed and the best sunrises in the Maldives! With panoramic views of the lagoons and islands, whilst flying low enough to almost touch the water (please don’t try this) the Seaplane is an experience all by itself. A honeymoon should be full of breath-taking memories and it doesn’t get any better than this. From sampling the VIP lounge refreshments to the exhilarating take off, forget that speed boat transfer and upgrade to the Seaplane. Feeding baby sharks is another world class experience the Maldives offers - South Ari Atoll is home to the black tip reef sharks and at feeding time this lesser known tourist attraction has become a real favourite. The baby sharks have become accustomed to the feeding so much they arrive at the same time every single day!